Chrichton's World: Review Crimson Peak (2015): Gothic Horror? NO! Chilling drama? NO! Boring soap? YES! Review Crimson Peak (2015): Gothic Horror? NO! Chilling drama? NO! Boring soap? YES! Usually it's a good thing if you can't define a movie by just one genre since that often gives the viewer more than they bargained for. 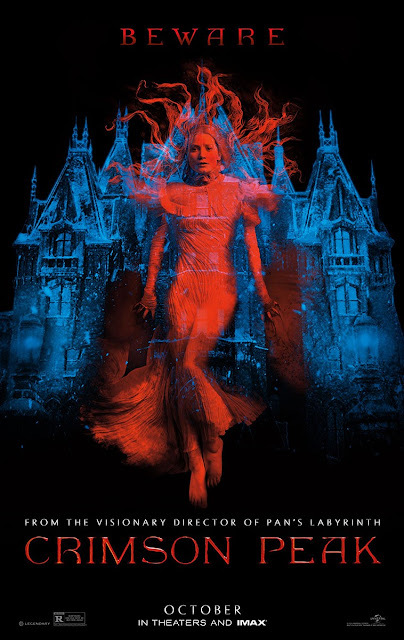 Unfortunately Crimson Peak does not do anything convincing no matter the genre you favour, it just disappoints. Crimson Peak starts real well. It does not waste any time to draw the viewer in. Right from the start we are served one creepy scene that serves as bait and basically tricks you into believing that at least the film will be compelling. And the haunting setting and other visuals back this feeling up. However at one point it feels like details about the supposed mystery are prolonged and avoided so strongly that very soon I suspected that there is not that much of a mystery. Here I was waiting to be dazzled by some awesome twist only to be let down by the incredible poor storytelling. Whatever was build up suspense wise (mostly by visuals) was immediately gone and turned Crimson Peak into a real bore fest. Mind you it's never super bad but it's not good either. Seeing how Guillermo del Toro normally is a reliable director I can't help but feel that he is slipping. His show The Strain also is filled with incredible poor plot developments. Crimson Peak is so much worse since none of the characters are remotely interesting or compelling. I did not care about any of them. Much emphasis is put on the romantic relationship between Thomas Sharpe (Tom Hiddleston) and Edith Cushing (Mia Wasikowska). And I did not buy any second of it. Not that their acting was that bad but the plot failed to show us the sexual tension and love between them. Both Thomas and Edit act like idiots since there were many opportunities to take action. Nothing prevented them to do so. If the plot had given us some real reasons I could have accepted that. Surprise surprise the plot even fails to do such a simple task. Seriously at one point I just wanted Crimson Peak to be over with cause everything was so pointless and all for the sake of romance that was barely there. By the time things get revealed to you it does not really matter since you will have figured out what is going on long before that. It's safe to say that Crimson Peak is incredibly underwhelming and a total disappointment. I can't recommend this. Only good enough to watch very late at night or a rainy Sunday afternoon.